Haddonfield Borough Hall is located at 242 Kings Highway East, Haddonfield NJ 08033; phone: 856-429-4700. Photo: Greenfield Hall, ca. 1747, 343 Kings Highway East, Haddonfield, NJ. Listed on the National Register of Historic Places in 1974. Photographed by User:Smallbones (own work), 2010, [cc-by-1.0 (creativecommons.org/publicdomain/zero/1.0/deed.en)], via Wikimedia Commons, accessed February, 2014. The borough was incorporated in 1875 from Haddon Township. Henry Wadsworth Longfellow's volume Tales of a Wayside Inn, contains the poem Elizabeth, which recounts the courtship by John Estaugh of Elizabeth, daughter of John Haddon, for whom Haddonfield was named. Her father, John purchased 500 acres in what was then Gloucester County, but poor health prevented him from escaping religious persecution. Elizabeth came instead, sailing from Southwark England in 1701. The first Haddonfield post office was opened in 1803 with John Clement appointed as first postmaster. 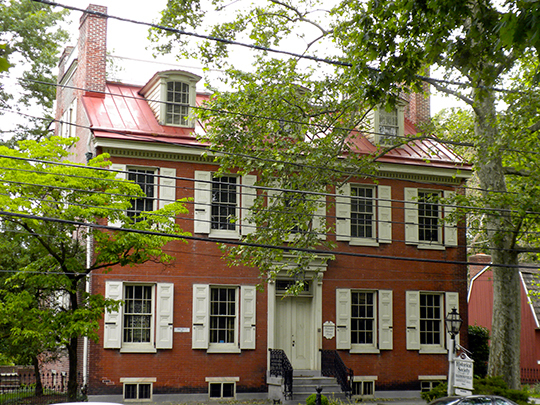 The Haddonfield Library Association was organized in 1803 by members of the Society of Friends.